The "temp industry" is experiencing a sea change. Candidates and companies are both finding their way to digital channels. Many candidates have already registered online with a company before even setting foot in one of their agencies, vacancies are shared and found on social media and contracts can now also be digitally signed. This has compelled the temp industry to at how agency networks are organised. It is crystal clear that they need to rethink their physical network. Where should you have a branch in the future? How do you match the operating area and functions of branches with the potential in the area? How you can efficiently target and connect with potential customers? The majority of the industry players is already experimenting with this. Some temp agencies have moved from Triple A locations to more accessible locations. Others open branches in business parks and cluster small branches into larger expertise centres. But it is clear that much more remains to be done! Mapping the physical network of the future is far from easy. The matchmaking process between candidates and companies also complicates matters. RetailSonar, however, succeeds in arriving at specific insights and answers with proven and data-driven predictive models. What’s more, our platform also generates durable solutions in a rapidly changing market. 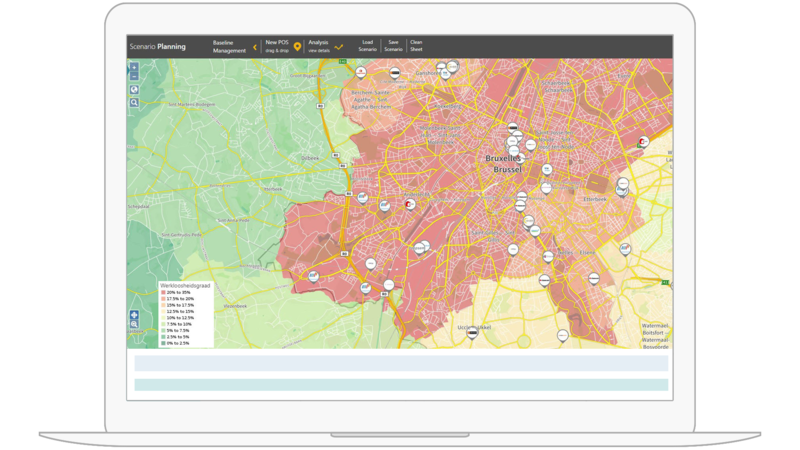 Create an accurate mapping of the total market potential for candidates and companies, based on up-to-date market data and a clear definition of your target groups. Visualise the theoretical potential of every branch based on competitive pressure, location quality and the effective behaviour of customers and candidates. This helps you identify underperformers and overperformers. See which underperformers can become profitable and which ones should be relocated. Factor in the risks of customer turnover and the recapture potential of other branches. Analyse the future impact of digital services on your branch network. Identify the (greenfield) optimum branch network and discover opportunities for the relocation and clustering of existing branches and the opening of new branches. Design the optimum branch network for the future: with maximum potential for the inflow of candidates and customers, at the lowest possible operational cost. Manage the roadmap to develop into the optimum branch network with a user-friendly and flexible platform. Make changes to flexibly respond to opportunities or the actions of your competitors. 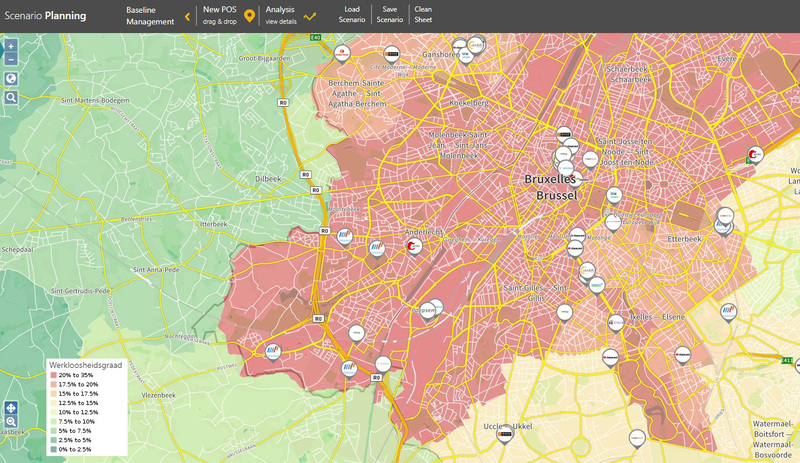 Map the real sales dynamics for the inflow/outflow of customers and candidates by neighbourhood and by branch. Analyse how efficient branches are at converting vacancies into job placements. The result is a 360-degree view of the performance of your existing branches. Match the service and capacity of each branch with the potential and structure of its surroundings. Use the surrounding area and rental cost as a factor to determine which specialisation would be more suitable for branches. Optimise the service you offer to customers and candidates. Identify the weaknesses of branches that clearly have the potential to grow, based on objective reporting, and create opportunities for achieving this growth. Transpose these opportunities into specific actions, together with the branch manager, to efficiently adapt the branch’s operations and change how you target prospective customers in the region. Measure the impact of the actions and use success stories to roll out this data-driven approach across your network. Analyse historic leads for customer acquisition based on the type and size of the company and the distance to your branch. Use this to prioritise opportunities and define priority target groups for the prospection of new customers in every operating area. Devise the most optimal distribution of operating areas for customer management and customer acquisition across the branches in your network. Match the size of the operating areas with the branch’s capacity and adapt where necessary. Segment your marketing campaigns to reach the right target group with the right message. Implement efficient marketing campaigns by using the right medium and working in a more targeted manner. Continuously increase the ROI of your campaigns by better monitoring the results, thoroughly analysing your results and making changes where necessary.